COQUITLAM, B.C. - Final standings, award winners and results from the Federation of International Lacrosse (FIL) Under-19 Men's Lacrosse World Championship at Percy Perry Stadium. COQUITLAM - The United States came back from a 6-0 deficit to defeat Canada 13-12 Saturday in front of a standing-room only crowd at the 2016 Federation of International Lacrosse (FIL) Under-19 Men's Lacrosse World Championships presented by Novus. Earlier in the day the Iroquois Nationals defeated Australia 20-8 to win the bronze medal, while England won the fifth-place game against Israel in a close 10-7 contest. 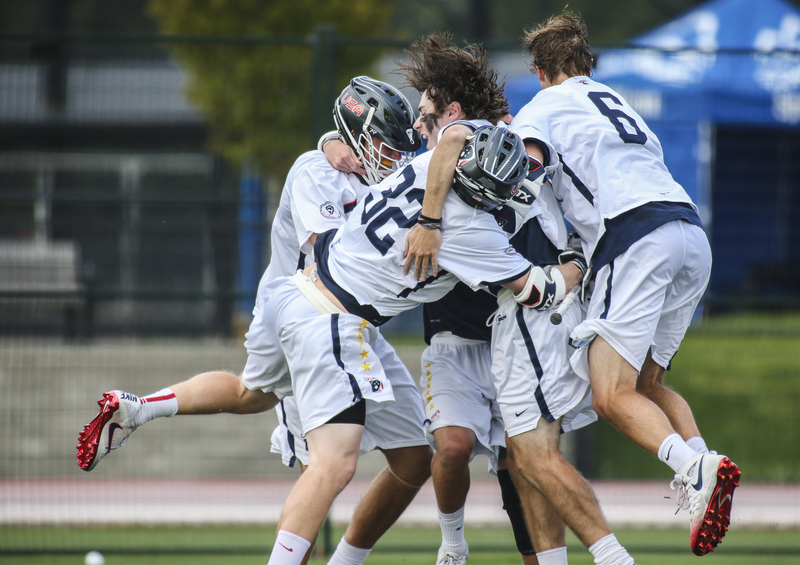 Ryan Conrad scored with eight seconds remaining coming off a screen and burying the ball, capping off an unbelievable comeback for the Americans who trailed 8-2 at the half, giving the Americans their eighth title on the U-19 world stage. "So we have a set play called Buffalo where we basically overload one side and we have one guy on the side and he is dodging. We held it to the last second and we have a guy going back-side, a guy going up top and two guys going down to the crease. Luckily, I was able to slip to the back side, Simon Mathias hit me on a perfect feed and I was able to finish it," Conrad said, who had a Canadian defender draped all over him as he cut to goal. "Honestly, I just threw it, I didn't really see it because I got crushed right after I hit it, so when I heard the cheers, that is when I knew it went in. Everything you do leading up to this game is how you make plays like that." U.S. head coach Nick Myers was proud of his squad for the resilience and comeback - the last play was executed to perfection. "We wanted to hold it for one, we tied it with about two and some change [to go] and we felt like we had the advantage at the X," Myers said. "We won the faceoff, we held the ball and we went with the kid who scored the game-tying goal in Bernhardt who's been breaking people down most of the tournament - he's been an incredible dodger for us. We brought him out with fresh legs, he made the play... They executed it, kicked it to our X, we got an inside look, put it right on Ryan's stick and he finished." "We're world champs. I'm just really proud of the kids," Myers said. "I think that there's no script for this. I think what we did and you look at the whole process and the whole body of work from every exhibition we've had, having that overtime game in January with these guys, having two one-sided games and then you felt like today was going to come down to it." "When they had the early lead I felt like we would make a run, I felt defensively we made some key stops there at the end and we kind of pressed out and had to get out and force the tempo and we knew we were going to have to make a couple and Willie [Klan] really really came up big for us and then we got in a little bit more of a rhythm offensively and I think once we got in that rhythm you could feel the momentum on our sideline and again Austin [Henningsen] did a really nice job at the faceoff X and we were able to climb back in." Conrad (2G), Mathias (2G, 1A), Mac O'Keefe (2G, 1A), Timmy Kelly (2G), Alex Roesner (2G), Dox Aitken (1G, 1A), Michael Sowers (1G, 2A) and Jared Bernhardt (1G, 1A) scored for the balanced U.S. attack. Willie Klan made eight saves in the U.S. net for the win, seven of those coming in the second half. For Canada, Surrey, B.C., native Tre Leclaire had three goals in his best game of the tourney, while other scoring came from Ethan Walker (2G, 1A), Tanner Cook (2G), Jeff Teat (1G, 2A), Ryland Rees (1G), Riley Curtis (1G, 2A), Ryan Lanchbury (1G, 1A) and Justin Inacio (1G). Kyle Hebert played well, especially in the opening half, for Canada in the cage making 10 saves in the loss. For Canada, the game can only be described as heartbreak. But an admirable effort for a Canadian team that lost 12-5 to the Americans in the opening night game between the same squads. "It was incredible atmosphere here. I cannot thank our fans and fans from both sides to support their teams enough who were here to support their teams. It was a tremendous atmosphere and an exciting game and that's what you hope for in a world championship," said Team Canada head coach Taylor Wray. It was a second half recovery for the Americans that caused the broken hearts with over 3,000 fans and players watching in person in a capacity crowd. "They got going on the faceoffs... we were good there in first half. And in the second they got a few in a row and that kind of swung momentum their way," Wray said. "Lacrosse is a game of runs and when you score and you win a faceoff, and you score and win a faceoff, it's tough to break that momentum. They extended on us, and put pressure on us. We had some opportunities to put the ball in the net and when we did, they came up with some tremendous saves. They showed great resolve and played very well in the second half." Conrad knew his team needed a near-perfect second half to come back. "I think it was all about people saying we've been down before and knowing you can bounce back. We were down to the Iroquois and had a huge response with them. A big thing with our team is we have a lot of ease, and whatever happens to us, good or bad, it's all about the response to it. And we ended up having a great response to it and we came back and luckily enough we were able to get the win... I cannot ask for anything better." While the Canadian players were understandably deflated and dejected, their coach was happy with the effort. "I told them I couldn't be more proud of them," Wray said of his team. "They should be proud of themselves. Sometimes you lose and you play a good game and lose, and sometimes you don't play a good game and win. In the end if you play the way your's supposed to play, you play hard you give it your all, you prepare the right way, then the score is what the score is. I'm really proud of this group. I don't think many people gave us a chance in this game and you know to get the start that they did and be in control for most of the game was really, really impressive." "To be in a one-goal game with these guys on this stage... that is what I figured it would be. I didn't think it would continue 8-2 or a six-goal spread. You knew they were going to come back and I figured it would be like this at the end," Wray said. "When we got to 12-9 I thought, 'alright if we can get the ball and control the tempo a little bit here, we'll be alright.' And then they scored... and I felt like alright then if we can get the next one we'll be in great shape and we never got the ball back." Canada had a chance to tie the game in the dying seconds as Inacio won the draw and drove to the cage at the end, but the intended recipient of the pass was just out of reach of the ball and the U.S. got late possession to hold on for victory. COQUITLAM - Mitch Laffin scored six goals and added three assists as the Iroquois Nationals won their third consecutive bronze medal at the U19 level Saturday at the 2016 Federation of International Lacrosse (FIL) Under-19 Men's Lacrosse World Championships presented by Novus. Laffin, Austin Staats (3G, 3A), Tehoka Nanticoke (2G, 1A), Matthew Bennett (2G, 1A), Sekwanee Baker (2G), Doug Jamieson (1G, 1A), Skkylar Thomas (1G, 1A), Devon Buckshot (1G) and Tyson Bomberry (1G) provided the Iroquois scoring. Gordon Purdie Jr (2G, 2A), Mathew Wood (2G, 3A), Jordan Campbell (2G), Brayden Panting (1G, 1A) and Keegan Davies (1G, 1A) provided the Australian offence. Head coach Freeman Bucktooth was pleased with the result but said the team had hoped to be playing for gold. "We played OK. We could do a lot better and the guys know it," Bucktooth said. "They came here to get the gold and faced two tough teams, Canada and the U.S. But we're looking for the future, and hopefully we get better. So we get together, we come as a solid unit." 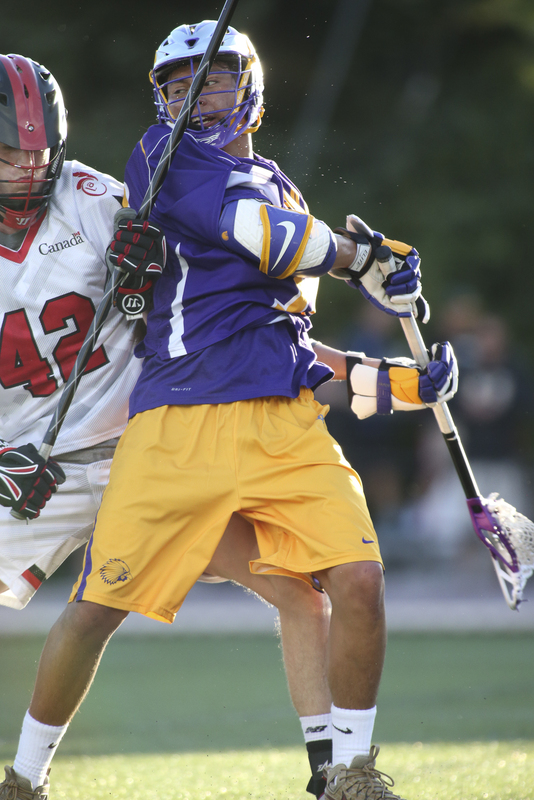 The Iroquois were coming off a tough 14-11 loss in the semifinal game against Canada on Thursday. "I just told the guys, 'We play for the Creator, his enjoyment. The sun's still going to come up tomorrow and you've got to live every day as it comes. Some things work out for you, sometimes they don't.' So, just trying to bring some realistic life history to it, to this game. So the guys played well, we relaxed. Yesterday we didn't practice, we didn't do anything lacrosse, did some travelling and sightseeing. I tell you, I won't mind coming out to B.C. every year, it's so beautiful here." This is the third consecutive bronze medal for the Iroquois at the U19 tournament, with others coming in Finland in 2012 and Coquitlam in 2008. They also won bronze in Australia in 1999. The Iroquois led 3-2 after the opening quarter before exploding for a 7-2 edge in second to lead by six at the break. Discipline allowed the Crocodiles from down under to creep back into the game - Australia's powerplay went 4-for-12, with three of extra-man goals coming in the second quarter. Australia played a strong opening quarter to make things tough. "We told them, ''Hey, these guys are coming for a medal, it's there for the winning, or there for the losing.' I asked what they wanted to do, if they wanted to win or lose the medal. It picked them up a bit and they started generating some goals, played better defence and ground balls." Laffin had his best game of the tournament - but some of that credit needs to be shared as close marking on Staats and Nanticoke opened up the attacker from Onondaga. Jamieson was impressive winning 16 of 26 draws. The momentum was going in Australia's favour until Staats and Nanticoke each tallied in the final minute of the half. Australia finishes in fourth, hitting a goal to move up in the U-19 placings after a fifth-place showing in 2012. Their best-ever placing is second which they achieved in 1992 and 1996. For the Iroquois this is another step forward for the program. "We're putting more guys in college. This team, I think, has only got three college players," Bucktooth, father of star Brett Bucktooth, said. "We may have around 250 kids that - if they all came out and tried out we might have a grand total of 250 kids in this age bracket, whereas Canada might be 250,000 at this age and in the U.S. even more. So it just goes to show that for us to be able to play at this level of competition, we've got a lot of heart and quick sticks. So they've got some good athletes. It's tough to beat good athletes." "And they've been together," Bucktooth adds. "Where we've been together just about a week before we came here. We were still a selecting and team and that's our fault - we were tardy on that part. And something I've been always trying to get the organization - let's get our coaches picked in advance. The U.S. and Canada, they have their team picked before the Iroquois have picked their coaches." The Iroquois will be hungry when the world U19s go to Ireland in 2020. 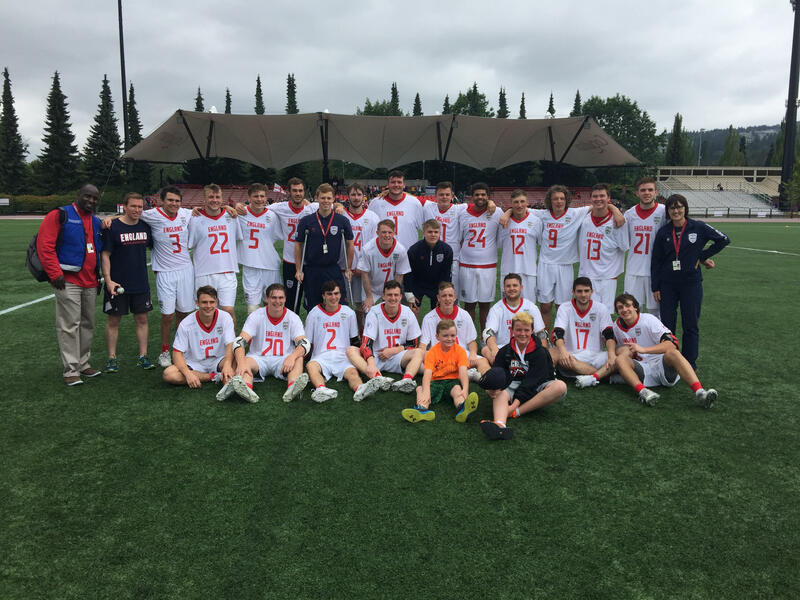 COQUITLAM - Austin Hudson scored five goals and older brother William made 11 saves as England came back in the second half to defeat a feisty Israel team 10-7 in the fifth-place game of the 2016 Federation of International Lacrosse (FIL) Under-19 Men's Lacrosse World Championships presented by Novus on Saturday July 16. "We weren't playing to our full potential in the first half," said Austin Hudson. "We got down kinda early. 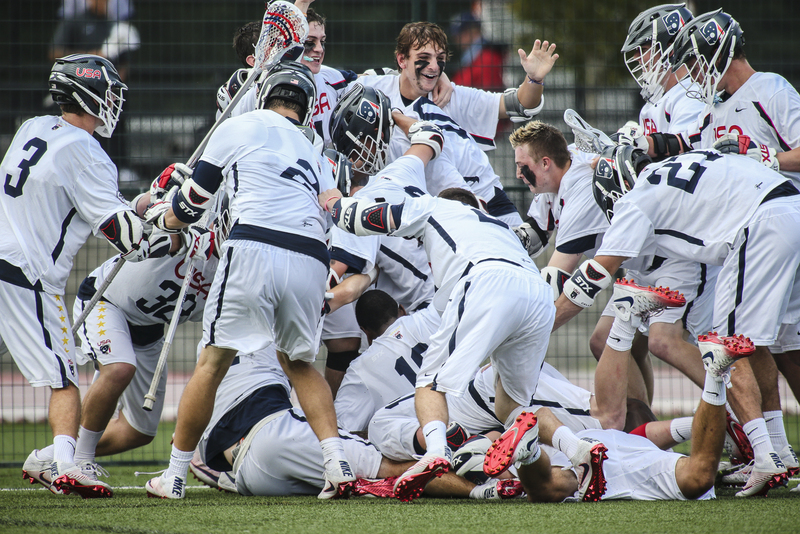 Going into halftime, Coach (Paul Coups) pulled us together and was basically, 'you've got to play some England Lacrosse' and we really picked it up in the second half, started playing for each other and we got the result that we wanted." Israel jumped out to a 4-2 half-time lead, thanks in large part to great goalkeeping from David Metzger, who finished with 12 saves including several worthy of the highlight reel in the second half, and long-stick midfielder Noah Knopf who scored two first-half goals. But England stormed back in the second half, on a 5-1 run in the third quarter. "I think the defence started to loosen up a little bit and, you know, great job with the middies, they were starting to look inside, we got those quick feeds and I was able to find some space and put it away," Austin Hudson said of the second half adjustments. "Our defence started tightening up, the offence didn't really feel the scoreboard pressure during the second. We started taking more time on offence and the goals came from sets... We came out and got two or three quick goals and from there we weren't looking back." Other England scoring came from Alex Russell (1G), Elliot Leonard (1G), Tim Collins (1G, 1A), Harry Dyson (1G) and Zach Peng (1G, 1A). James Ready added two assists. For Israel, Nick Shulkin added three assists, with goals coming from Knopf (2G), Sagi Hashai (2G), Alex Berkowitz (1G), Alon Bechor (1G) and Ilan Hascal (1G). Faceoff specialist Zachary Ornstein went 14-for-17 at the faceoff X. Both teams battled hard in a physical and intense game. It was Israel's first trip to the U19 worlds and they finish in sixth place. England finishes in fifth. And while it may not of have been the performance they wanted, they played their best game at the end. "It's always disappointing starting off the way we did," said Austin Hudson. "(Going) 0-4 is tough, but we fought back and won the games that we needed to. We kept saying, 'do it for the guys four years from now, give them the opportunity to play in the Blue Division' and we did ourselves with a win." "It's awesome," he added of the overall experience. "I know we're going to go out tonight and celebrate. We're definitely in a good mood. I'm totally excited." COQUITLAM - A five-goal night from Tom Lyons, including the eventual game-winner, led Ireland to a 16-12 win over Germany in a wild and entertaining seventh-place game. 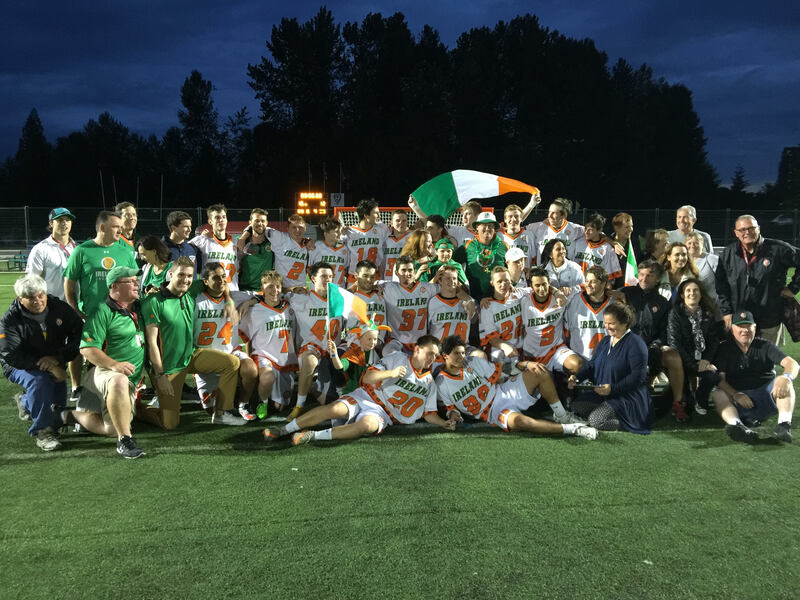 The game featured seven ties and two lead changes, before Ireland put the game away with five goals in the fourth quarter at the 2016 Federation of International Lacrosse Under-19 Men's Lacrosse World Championship presented by Novus on Friday. "We just had to keep our heads," said Ireland midfielder Ruairi Dunbar. "It was very tough mentally, this match was, and we all had to come together, as we've done previously in the tournament - as a family - and keep going." The Carlow, Ireland, native scored the game's final goal, his first in international play. "It was a bit sore," he said, "But it felt great to get my first Irish goal, especially in a match like that - how intense it was. Just a great feeling." Rory Madigan added seven points for Ireland, on three goals and four assists, while Conor Austin also scored three times. A pair from Patrick Magliocchino and singles by Jason Reid and Roan Gideon rounded out the Irish scoring. For their part, Germany had a balanced attack, with eight different goal scorers. Jeremiah Vanderkin-Jus scored a hat trick, while Soeren Spiegel and Jakob Bockermann each netted pairs. Singles by Lukas Kins, David Beckmann, Finn Post, Kai Sontowski and Per-Anders Olters rounded out the scoring for Germany, who finished seventh at the last U-19 championship in 2012. John McKeague picked up the win in goal for Ireland, making five saves. Florian Faellenbacher and Mikhail Zinoviev split goalkeeping duties for Germany, combining for eight saves. Ireland's Ciaran Lewis was 16-for-24 on faceoffs, while Germany's Lukas Kins was 7-for-16 and Finn Post was 3-for-10. Ireland finishes seventh in the first appearance at the U-19 level. They are the hosts of the next championship, to be held in Limerick in July 2020 and will be looking to improve on that finish. "We just keep building the program of Ireland Lacrosse and just get ready for the next world tournament," said Dunbar.